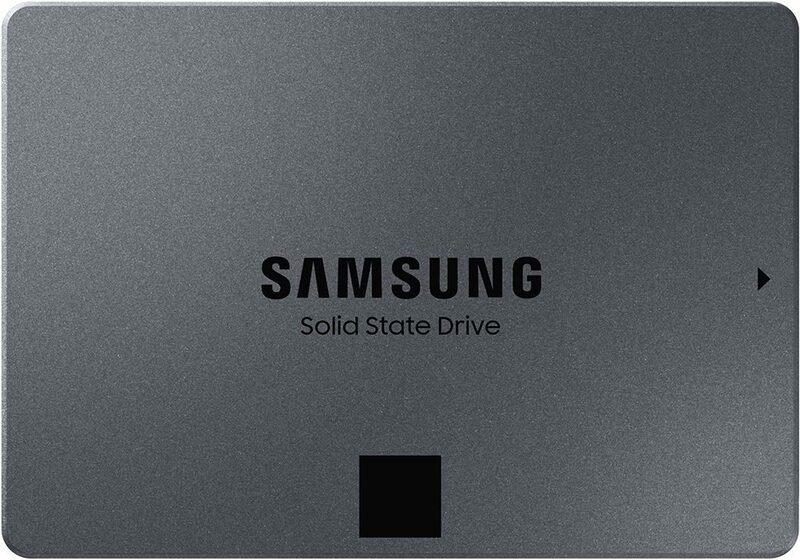 Today, Samsung released their new solid state drive line up designed for consumers who want speed and capacity in one package without sacrificing cost – the new Samsung 860 QVO SSD series. The 860 QVO series sits below Samsung’s popular 860 EVO SSD series. The new 860 QVO features Samsung’s V-NAND 4-bit MLC NAND flash as its main storage memory; paired with Samsung’s MJX controller. It still offers fast read / write speeds, as expected from an SSD, and it’s also relatively cheap. Starting at $149.99 for the 1TB model, it’s cheaper than the Samsung 860 EVO 1TB’s MSRP of $199.99. It’s available in 1TB, 2TB and 4TB capacities. 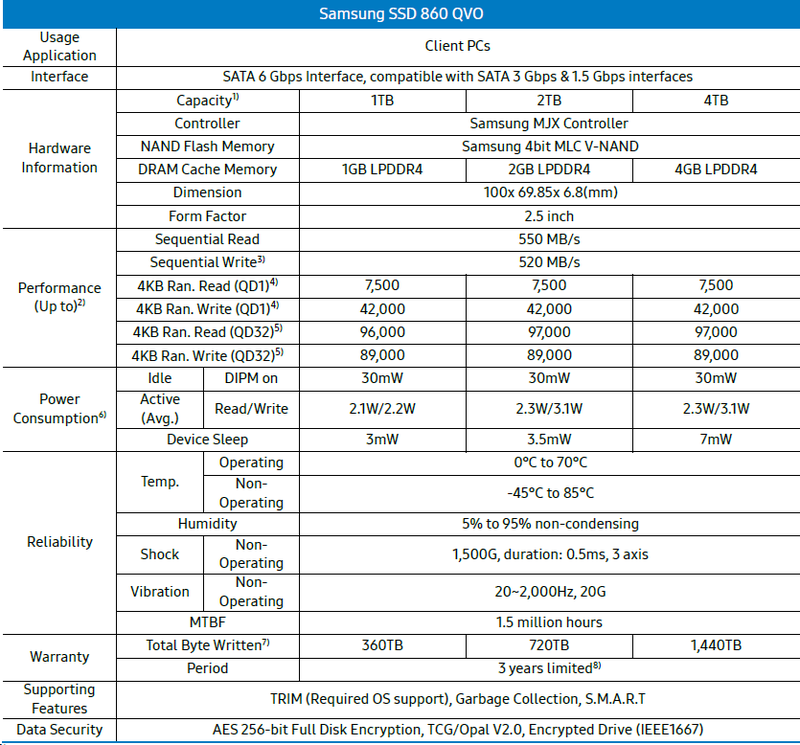 So basically, the 860 QVO is the “entry-level” among Samsung’s SSD series; followed by the mainstream 860 EVO and their top of the line 860 PRO. But what’s the catch? There’s always a catch, right? Well, check it out below. The new Samsung 860 QVO (Quality and Value Optimized) SSD series is based on a QLC technology or Quad-Level Cell flash. A 4-bit MLC is basically or commonly known as QLC; so it’s not really an “MLC” and you’re not getting the same level of endurance compared to a real “MLC”. Also, QLC is not as fast compared to higher or other types NAND flash. But Samsung has a trick under its sleeves called Intelligent TurboWrite; where it improves the sequential write speed of the SSD for a limited amount of file size. After the cache is exhausted, the write speed significantly drops to 80MB/s – 160MB/s depending on the capacity of the SSD. On paper, the Samsung 860 QVO looks very similar to the Samsung 860 EVO. Their read and write speeds are more or less similar and they look like on par with each other. Except that the 860 QVO is using a 4-bit MLC V-NAND (a.k.a QLC NAND), while the 860 EVO is using a 3-bit MLC V-NAND. Both features Samsung’s MJX controller and is available in 1TB, 2TB and 4TB capacities. But if you look closely at the warranty period, Samsung is only offering 3 years limited warranty for the 860 QVO. On top of that, its endurance rating or Total Byte Written is only almost half of what the 860 EVO offers on the same capacity. For example, the 1TB 860 EVO offers 600TB of TBW, while the 1TB 860 QVO only offers 360TB of TBW. Nevertheless, the Samsung 860 QVO SSD series offers a very good price/GB ratio. Performance isn’t similar to an EVO or PRO series but it’s decent enough. Most users wouldn’t feel or see the difference in regular use case scenario, especially when the cache isn’t exhausted. I’m thinking of getting one for the expansion of my game drive. The Samsung 860 QVO SSD series is available starting December 16, 2018. Just in time before the holiday season. It starts at $149.99 USD for the 1TB; $299.99 for the 2TB capacity and $599.99 for the 4TB capacity. Some of you might be wondering why are they more expensive than the current 860 EVO? Well, the 860 EVO has been in the market for quite some time now. The 1TB 860 EVO has an MSRP of $199.99, $399.99 for the 2TB and $899.99 for the 4TB. Those prices are definitely more expensive than the 860 QVO. Not to mention, Samsung 860 EVO’s prices are now discounted due to the recent Black Friday and Cyber Monday deals. The initial prices of the 860 QVO you see above are the MSRP, and I’m positive that retail prices (or street price) may be lower than the SRP.